Even by the sometimes unpredictable standards of modern pro tennis, the 2017 season was a humdinger as top players struggled with injury and spotty play, while former champions previously deemed over-the-hill emerged revitalized. Poet and Paris Review sports columnist Rowan Ricardo Phillips followed the men’s tour circuit for the entire calendar year, and his observations on the sport form the backbone of The Circuit: A Tennis Odyssey. Though Phillips utilizes the standard sports journalism playbook in some respects —breaking down the minutiae of major tournaments, analyzing player strategies and pivotal matches—he opts for a more considered, meditative approach. Both present in the moment and gifted with the benefit of hindsight, his recollections of the season reveal a kaleidoscope of shifting fortunes, where the results of a point or tournament can portend better things to come, or herald disaster. 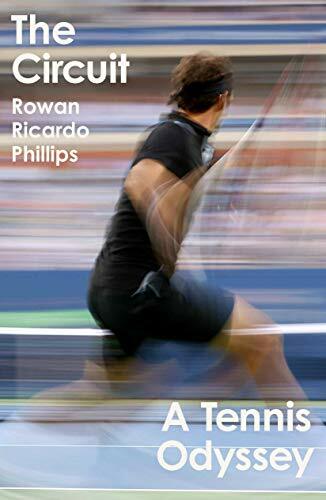 As an example of Phillips’ perspective, look no further than the season’s first major showcase, the Australian Open. Most tennis aficionados have fond memories of the tournament’s 2017 final between Roger Federer and Rafael Nadal, which went the full five sets and included an epic 26-shot rally that ranked among the best moments on tour all year. Phillips ignores the rally entirely to focus on a much less heralded juncture a few points before, in which a shot by Nadal clipped the top of the net, the fate of the match (and both players’ futures) hanging in the air for an agonizing second. Philips revels in the existential nature of such moments, and the razor-thin margins between success and failure. The top stars receive due attention, but Philips also makes room for the eternal second bananas, such as the quirky Guy Monfils, who has had limited success against the top players but displays an idiosyncratic, entertaining style all his own. While the four Grand Slam tournaments that dominate the schedule—the Australian Open, the French Open, Wimbledon, and the U.S. Open—are covered, Phillips finds just as much to savor in a relatively meaningless first-round showdown between up-and-coming American phenom Frances Tiafoe and Federer, as youth duels experience. Tennis writing has always lent itself to rumination, and throughout The Circuit, Phillips ruminates with the best of them. His musings are expansive enough to include historical tidbits, references to Joyce and Tennyson, and even a few pointed comments on the current political climate. Nadal’s record tenth Paris Open title on the clay courts of Paris prompts a touching elegy for Georges Henri Gougoltz, the man who introduced clay court tennis to France exactly one hundred fifty years before Nadal’s 2017 victory, but tragically died before he could witness the fruits of his labors. The Sisyphean exploits of relative unknowns like Belgium’s David Goffin spur reflections on the sport’s fickle nature, as unanticipated injuries or the intercession of an incompetent chair umpire can impact and reshape the rhythms of a match (or entire career) in an instant. The Circuit isn’t for everyone; those seeking an encyclopedic explication of the ups and downs of the 2017 season, or any substantial mention of the women’s side of the draw, would best look elsewhere. But those who enjoy a more thoughtful approach in their sports writing will find much to savor. Ranging from the hopeful days of spring through the exhausting heat of summer towards the elegiac final tournaments of the year in autumn, Phillips celebrates the small stuff, riding the ebbs and flows of a particular player’s luck, or picking out individual moments in which skill, nerve, timing and luck combine to make heroes or fools of us all. Focusing on the art of sport rather than the noise that surrounds it, Rowan Ricardo Phillips preserves the memorable moments of the 2017 tennis season in concise, lively fashion.